I wanted to get let you know about a number of upcoming opportunities to watch the best players (in the country, and in the world) play live. Make sure you read all the way to the bottom to find out about a potential club trip to watch a National Badminton League match. Next weekend (Friday 5th - Sunday 7th February) all the best English players will be competing in this tournament, hoping to be crowned the best player(s) in the country. This tournament provides a great chance to check out the next generation of English players as well as our current top players. Although the tournament is being held up at the University of Derby, the finals (which are being played on Sunday) are going to be live streamed so you will be able to watch them from the comfort of your home! The live stream will be available from 12 noon on Sunday on BADMINTON England's YouTube channel. If you miss the live stream then they are usually available to watch a few days later. 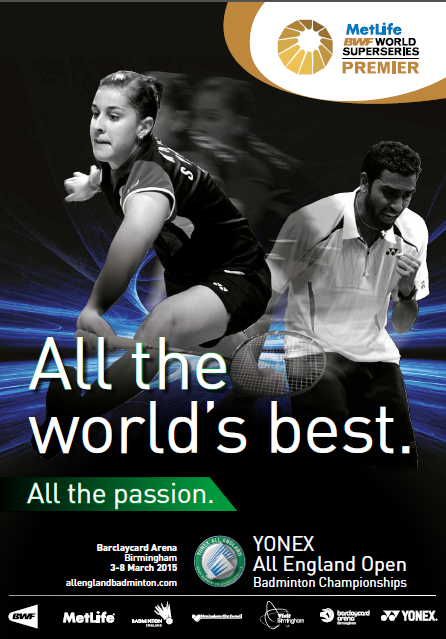 One of the oldest and most prestigious badminton tournaments in the world. Each year the world's best players battle it out at the NIA in Birmingham. Spectators are welcome all the way from the qualifying rounds through to the finals (Tuesday 8th March - Sunday 13th March). There's always plenty going on both on and off court (autographs, photos, smash challenge, competitions, Yonex shop) so it's a great day out and the atmosphere is fantastic. 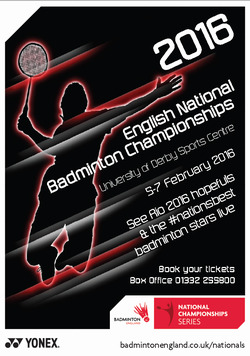 Check out allenglandbadminton.com for information about the tournament and to buy tickets. If you are a BADMINTON England member (which most of you should be) then you should have received an email containing information on how to claim free tickets for the Tuesday session. In its second season, the National Badminton League is the first ever professional badminton league in the UK. There are currently 6 teams (Birmingham, Derby, Loughborough, Milton Keynes, Nottingham and Surrey) that compete at monthly match nights to battle their way to the top of the league. Matches are broadcast live on Sky Sports and live streamed on the internet around the world. The League features a new scoring system and some additional rules which make the games really exciting to watch. 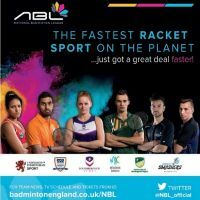 Check out nationalbadmintonleague.co.uk for the latest news and a list of upcoming fixtures. Tickets are sold for every match if you want to watch the action live. Otherwise you can catch the matches on Sky Sports or online. Previous videos of the matches are available on BADMINTON England's YouTube channel. On Monday 21st March, the Birmingham Lions will be playing against Surrey Smashers at the Great Hall in Birmingham. As this is currently the closest venue to us that NBL matches are played, I'd like to propose a club trip out to watch it. I'd like to gauge interest in organising such a trip so if you would be interested in coming then please email me and let me know. Don't worry - at this stage you aren't committing to actually coming. Friends and family are welcome so let me know how many people you would potentially like to bring as it should help me try to negotiate a discount on the price of the tickets. It would mean leaving Cheltenham at roughly 6pm and getting back at about 11pm. Tickets should cost a maximum of £10 for adults and £5 for juniors.